Overall investment management research spending will decline as transparency and innovation usher in increased competition. Boston, June 15, 2017 – Among the raft of legislative standards set out under the European Union’s revised Markets in Financial Instruments Directive (MiFID II), the unbundling of investment research from execution payments has been one of the most contentious. While unbundling may seem like nothing more than a process formality, its implications for the industry are profound, and it could have global repercussions. On the buy-side, firms are faced with the prospect of having to pay for something they traditionally receive without an explicit price. How will these firms react? The first in a series of two, this report looks at the latest call for unbundling in the EU and its repercussions in the investment-research industry and across buy-side firms. It is based on Q1 2017 Aite Group interviews with global and regional investment managers, brokers, independent research providers, and vendors to understand their perspectives and insights on the pending MiFID II regulation. This 35-page Impact Report contains seven figures and five tables. Clients of Aite Group’s Institutional Securities & Investments service can download this report, the corresponding charts, and the Executive Impact Deck. 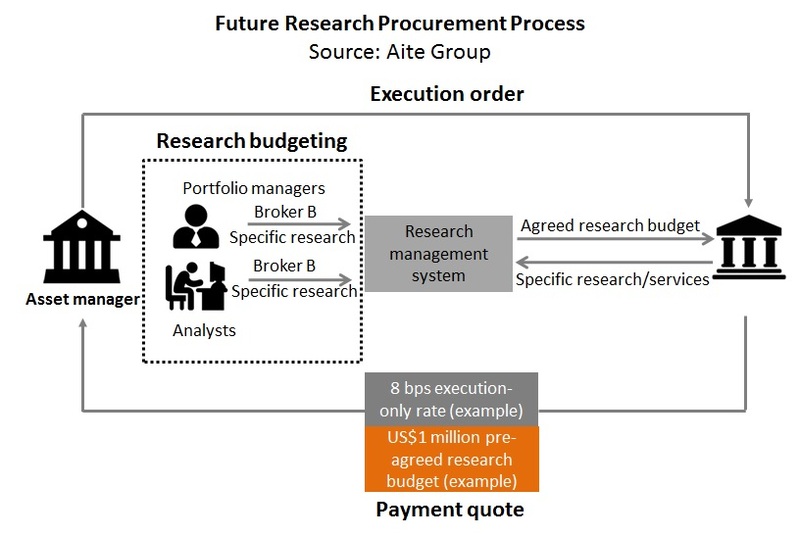 This report mentions 7Park Data, Accern, Airex Market, Alphametry, AlphaSense, AnalytixInsight, Bloomberg, Castine, Commcise, Connotate, CorporateAccessNetwork, Cowen Convergex, Dealogic, Eagle Alpha, ERIC: Electronic Research Interchange, Estimize, ExtractAlpha, FactSet, FeedStock, FinStats, HedgeChatter, IBES, ICE, LSE, IHS Markit, Instinet, ITG, KCG, Kuberre Systems, Liquidnet, Market Prophit, Meetyl, Morningstar, Premise Data, RavenPack Partners, Research Tree, ResearchPool, RS Metrics, RSRCHXchange, Seed Alpha, Smartkarma, SpaceNow, Substantive Research, Thinknum, Thomson Reuters, Visible Alpha ONEAccess, and WeConvene.